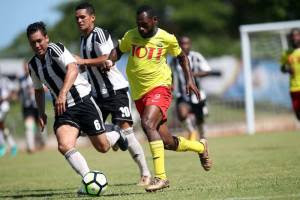 Nigel Dabinyaba’s almost telepathic connection with fellow Papua New Guinea footballer Raymond Gunemba is a joy for fans to witness. The pair have been playing together since they were kids, before graduating to the National Soccer League playing for Hekari United before joining Peter Gunemba’s Lae City Dwellers. They’ve also been playing side-by-side in the Papua New Guinea national team. Despite the success they have enjoyed together, the pair went their separate ways Raymond heading to New Zealand to play, while Dabinyaba took up his first professional contract with Penang in the Malaysian Super League. It was one of the first times the dynamic goal scoring duo had been separated on the field and Dabinyaba admits that at times it proved hard to handle. “I really missed the boys so much,” he said of Gunemba and his Lae teammates. “They’re like my brothers. I had some new options, contracts, but I had to leave them and come back because I missed the boys and missed playing with them. Dabinyaba has been back in the fold of his former club in the Papua New Guinea National Soccer League since it got back underway this year. He said coming back to play alongside his ‘brother’ has been a highlight of his return to his native Papua New Guinea and Lae. “When I left, there was no one who understood me very well. I’m happy being back playing with Raymond and hopefully we’ll be doing even better in the coming games. Although he’s pleased to be back, Dabinyaba is also quick to point out the sejourn with Penang was a fruitful experience. “Professional level, it’s quite different,” he said. “You get so many players from different countries playing together there and that makes the difference. Players from South America, from Europe, so it’s quite tough out there. He added that the cultural change was a big factor that took some getting used to. Being back now, Dabinyaba is trying to make an impact. But points out he’s just one person in a team. “Coming back is a bonus for me and for the team, but all the players here are good. I haven’t brought anything new into the team.